We look forward welcoming you to Hiroshima and other areas, which are rich in natural beauty and full of tourist attractions. We sincerely hope your stay in Hiroshima will be the highlight of your trip. We give our utmost hospitality to you. A: Peace Memorial Park & Hiroshima City (4Hours) -- "History tour of Hiroshima"
Until the A- bomb was dropped, the present-day Peace Memorial Park was the busy downtown hub of Hiroshima. 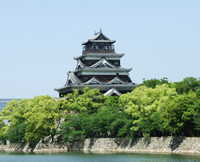 Hiroshima Castle was the fifth largest castle in Japan. But the Castle was completely destroyed by the A-bomb. The A-bomb victims managed to run away to Shukkeien Garden and died at last. By understanding the history of Hiroshima, you'll discover the secrets of the remarkable recovery of Hiroshima. Please listen to our guide's stories. B: Miyajima (4Hours) -- "Tour around Itsukushima Shrine"
You can really enjoy the magnificent view of Itsukushima Shrine and Torii on the sea, especially at high tide. They seem to be floating on the sea. 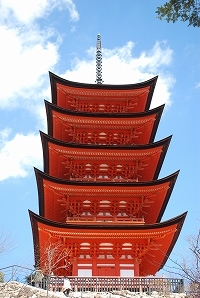 Also, you'll find Five- storied Pagoda and Senjyokaku are historically impressive and interesting. ------In front of McDonald's(1F), the South gate of JR Hiroshima Sta. C: Miyajima (7Hours) -- "Trip enjoying Miyajima to the fullest"
For visitors, Daiganji and Daisho-in are very interesting and accessible temples. Daiganji Temple used to play a central role in the temples on the island. Daisho-in Temple is one of the most important Shingon Buddhist temples. 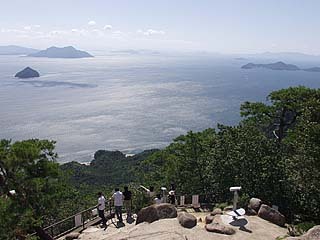 Behind Daisho-in Temple, there is a spiritual mountain called Misen, where there are marvels or wonders, and whose observatory commands a picturesque view of the Seto Inland Sea. Discover beauty of Japan here, please. D. Miyajima & Hiroshima City (7Hours) -- "Tour of Two World Heritage Sites"
Miyajima and Hiroshima City are full of tourist attractions. You'll feel your tour ends too soon. You'll wish to stay longer here. ------Itsukushima Shrine, Senjokaku, Five-storied Pagoda, A-bomb Dome, Peace Memorial Park, and Peace Memorial Museum. Price is based on the type of the tour. Please pay in cash (yen) at the meeting place before your tour. ~~~Additional guide service is available at 3,000 JPY/hour. ~JR pass entitles you to free rides on JR trains and JR ferries. ~You can combine and modify sightseeing spots according to your wishes. Please feel free to ask your guide. Please click "Contact Us" or apply for a guide-interpreter at the front desk by 5 p.m. 1 day before your tour. Peace Communication Corp. is closed on Sundays, April 28th- May 7th, August 9th - 18th, December 27th - January 6th and national holidays. No answer to your mails is provided during these days. Okonomiyaki Hiroshima-style is a mixture of flour and water spread out on a hotplate then loaded with cabbage, bean sprouts, soba noodles, meat and egg which is cooked to perfection and topped with a sweet sauce. These are soft sponge cakes filled with refined red beans. There are a variety of flavors including cream, cheese and chocolate fillings. A rice scoop, originating in the 18th century, was invented by a Buddhist monk in Miyajima. The rice scoop in the shape of a Japanese musical instrument "Biwa" is said to "scoop good luck to your family", so the rice scoop is a popular souvenir. Kumano is famous for its high quality brushes. Each of them is carefully hand-made by a highly skilled craftsman called "Fude tukasa". Kumano accounts for 80% of domestic production of brushes including machine-made ones. In recent years cosmetic brushes in Kumano, which were presented to Nadeshiko Japan, have become very popular.